In 1975 I was introduced to the lute and its repertoire by Vancouver lutenist, lutemaker and lute historian Ray Nurse. Under Ray's direction I learned the skills required to build lutes, but of perhaps greater importance I was guided into pursuing my own inquiry into surviving historical instruments. In 1978/79 I toured European museums for a full year: examining, meticulously documenting, and photographing most of the important historical lutes that survive. This direct experience of the instruments of Renaissance and Baroque lutemakers has given me a solid grounding in the traditions and aesthetics of the past masters. In 1986 I was awarded a Canada Council grant, enabling me to apprentice for a year with lutemaker Stephen Gottlieb in London, England. Since my return to Vancouver, B.C. in 1988, I have worked fulltime as a lutemaker, producing instruments of the highest quality for an international clientelle of both professional and amateur players. 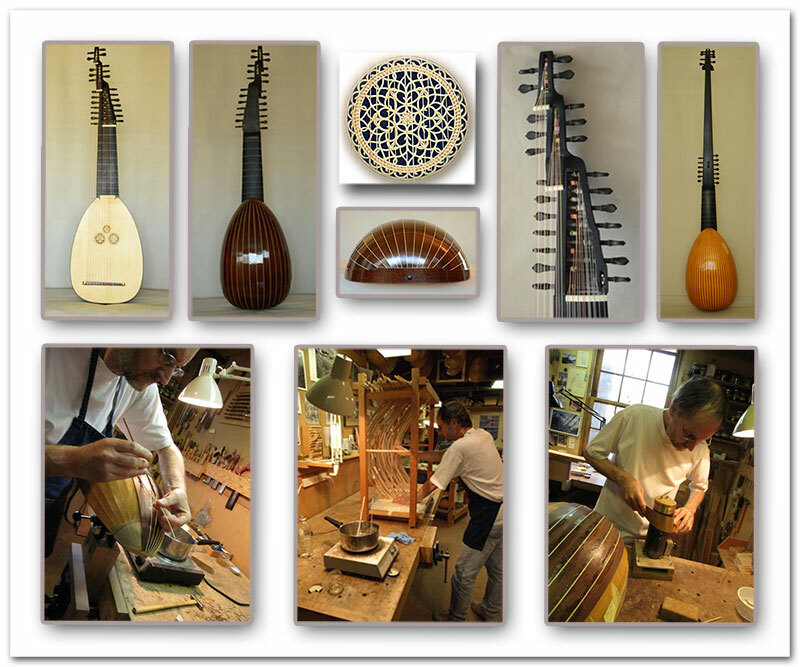 I have built instruments for some of the world's finest lutenists, including Paul O'Dette, Jacob Heringman and Robert Barto; and for a number of years I have taught lute building and lute maintenance classes at the Lute Society of America Summer Workshop West seminars. Wherever possible, the models I have developed are based on those surviving instruments which exhibit the appropriate qualities, proportions and style for their musical requirements. Where a suitable model is lacking, I have worked out my own designs (usually drawing on iconographic evidence). All my instruments are based on a careful consideration of the surviving lutes and their musical repertoire. I generally use the same materials as those found on surviving lutes (with the exception of ivory and some of the exotic hardwoods). I have an excellent supply of fine quality, seasoned timbers, which include German spruce, Pacific yew, curly and bird’s-eye maple, Swiss pear, English plum, Honduran rosewood and ebony. Hide glue is used throughout; this glue dries much harder than most modern glues, and helps to produce a clear-sounding instrument. I make my own turpine-resin oil varnish. It is difficult and time-consuming to both make and apply this varnish, but the finished result in both richness of colour and subtlety in sound cannot be achieved with commercial finishes. My instruments are assembled at between 38 and 42% relative humidity, which makes them very stable and crack-resistant. All my instruments are built to the highest standards of craftsmanship, with careful attention to detail and overall design.